Atterbury Pasture. 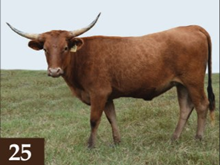 Here is a beautiful, El Coyote Ranch cow! Out of a VJ Tommie son. Lots of possibility here! Nice disposition and easy to work. Spring herd.